Growers plagued by black-grass should keep a look-out for the BASF Black-grass Battle Bus which will be visiting several key events this summer. The aim is to share knowledge from a range of experts on cultural and chemical controls as well as ideas and tips from agronomists and growers on how they control their weeds, says campaign manager Ruth Stanley. 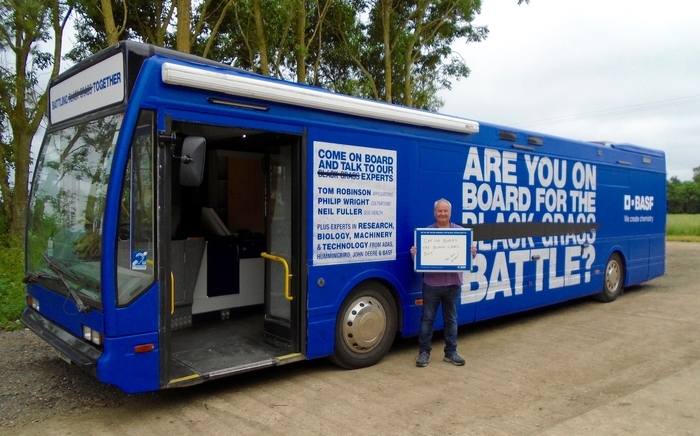 “The BASF Black-grass Battle Bus is a dedicated advice hub packed with information where growers can hop on board to get their black-grass control queries answered. “We’ve recruited a team of independent experts to share their thoughts on weed detection, cultivation techniques, application technology, machinery hygiene, weed biology, and the best chemistry. “There is no single element to successful weed control, but a combination of agronomic choices which can be made to improve the situation on farm,” she explains. At least one expert will be on board at each scheduled stop, and visitors will also be able to access information from other experts in the team, as well as information from BASF’s website and farmer trials, via laptops hooked up to the internet. There will also be a range of advisory leaflets and weed encyclopaedias on hand, so visitors will have access to all the necessary advice to ensure a full agronomic approach to weed control. Visitors to the website and the Battle Bus also have the opportunity to win an invitation to a BASF Black-grass Beaters Conference, including all expenses paid dinner and overnight stay, and a preview of the BASF’s black-grass herbicide of the future. “Growers often have some of the best ideas for controlling black-grass so we’d love to hear from them,” says Ruth. Philip Wright of Wright Resolutions Limited, an expert on cultivations and drilling techniques that target the control of key weeds. BASF experts will also be on hand to advise on weed biology and the best chemistry.